As soon as I walked in, I could tell this was a welcoming, neighborhood joint that only accommodated friendly riff raff =) This was an Irish-American tavern that was custom designed with the 3 Rs: reclaimed, recycled and reused materials and exposed brick and wood to make an atmosphere that was both rustic and charming, but modern and refined at the same time. 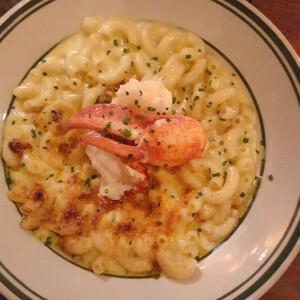 The Malt House has been in business for three years, and there was a good sized crowd on a weekday evening enjoying their beer and bites. We were greeted by Beverage Director and GM Alan Ngo who had spot on recommendations for beer pairings. The boozy offerings here were great! Not only were there awesome brews available, there were some captivating cocktail concoctions, a fine single malt and whisk(e)y collection, and diverse wine options on the beverage list, too. 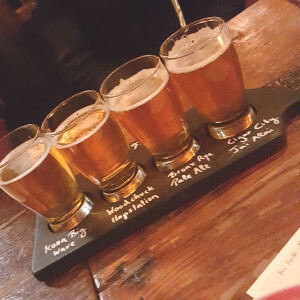 The Malt House has got your refined alcoholic tastes covered, and the best part is YOU CAN GET BOOZE FLIGHTS!!! Beer flights are about 10 bucks for a tasting of 4 of the 20-plus craft brews on tap and select whisk(e)y flights are $25. I’m already a sucker for alcohol tastings, and with this price, I’ll be your new best friend. What a steal. After sampling the beer tasting, I settled on a pint of Laguinitas Brown Shugga because of its amazing name. That, and because it was delicious and full-bodied and not bitter and was NOT an IPA. 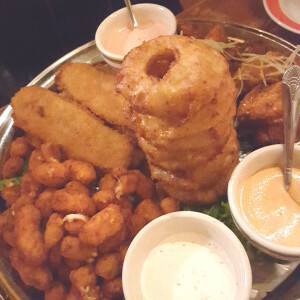 We started off with a giant platter of fried apps to soak up the suds… the basic bar food fare we all know and love, but better! The cheese curds were made of WHITE CHEDDAR and not mozzarella, and these were served with a homemade chipotle mayo. I liked the twist on tradition and liked the melty cheddar! We tried BFG wings, which were Baked, Fried and Grilled and accompanied by not just bottled blue cheese, but Roquefort cheese sauce. The wings had a great texture on the outside due to the triple cooking (take THAT, double fried foods) and the chicken meat was juicy and tender. 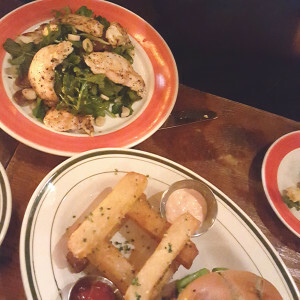 We also tried tempura and ale-battered pickles, served with an in house ranch sauce, and one of the reviewers had trouble finding the piece of pickle since it was a little too bready. Not terrible, and I thought it was rather fitting to have extra fried foods in this area. 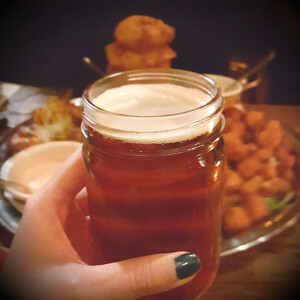 A surprise winner for me was the beer and bacon battered onion rings. I admit, I’m not a fan of onion rings; I’ve tried a bite every time someone else orders them, but there’s usually something about the taste or smell or something I don’t like. But I didn’t hate these! The smell and taste of the bacon came through and the beer in the batter made the rings light and crispy. These onion rings were GOOD. As part of the appetizer course, we got to try the steamed mussels. This was one of my favorite dishes. Every mussel was plump and clean (yay for no grit! ), there weren’t empty shells hidden in the bowl, they were super flavorful with bits of roasted tomatoes, garlic and herbs. The white wine broth had a good, light flavor and I loved the additional chunks of chorizo. 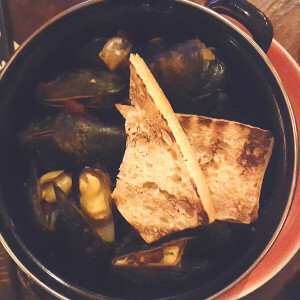 It was a really tasty combo of savory textures with the juicy mussels and the crispy grilled bread. The size of this app was enough for an entrée. My only suggestion: include more bread for dipping! Then, Exec Chef Armando Avila brought out some entrees. He’s got some legit street cred from STK and 5 Napkin, and he created some delightful dishes for the Malt House. To be honest, all five items we tried were solid! 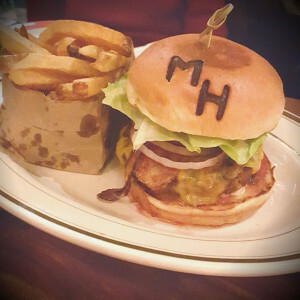 We started off with the Malt House burger, made with a mix of short ribs, chuck meat and brisket. I die. This in-house blend was masterfully cooked, with JUST enough toppings to make it a memorable burger. There was smoked bacon, onion marmalade, your basic lettuce/tomato/red onion/pickles, and cheddar sandwiched between the meat patty and soft bun. 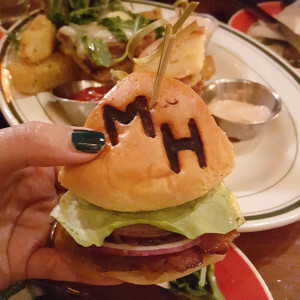 I liked the finishing touch on the bread with “MH” branded on the top of each bun! 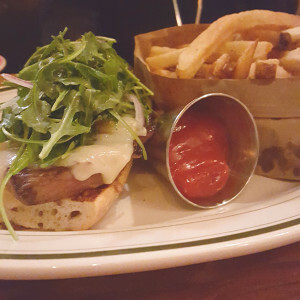 This solid burger could be served with fries or a salad, and we opted for TRUFFLE FRIES! The flavor of the truffle could have been stronger, and I liked the presentation of the log cabin stacked potatoes, but honestly, these carbs couldn’t compete with the delicious burger. Winner, right here. Another standout entrée was the fish tacos. I read about this new diet fad called a “taco cleanse” and if all the tacos tasted as good as these mahi mahi mouthfuls, I’d do it! It was as if the chef had plucked all the herbs and veggies from the garden that day, caught the fish himself just a few hours earlier, and made the tortillas in house. (Wait, I think they DO make the tortillas at the restaurant…) These were pretty damn close to being on par with famous San Diego and Tijuana tacos, I tell ya. The tortilla was soft, the fish was fresh and nicely fried, the beans, tomatillo, salsa verde and cabbage tasted GREEN and crisp (well, the purple cabbage wasn’t green but definitely crunchy! 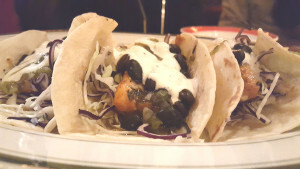 ), and there was a good spicy kick to it, with the fresh squeeze of lime to brighten the taco with splashes of acid and the sour cream sauce to cool your tongue. I also highly recommend this plate, too! This mix of greens included fresh watercress (quite a welcome change to boring salad bases), hearts of palm (a nice touch!) and cherry tomatoes. The salad was topped with a tender grilled chicken and lightly dressed in balsamic vinaigrette. I get so annoyed when I see wilted greens hidden in a salad or when there’s too much or too little dressing. But don’t worry, you won’t have that problem here. Everything was fresh and the dressing was just right, Goldilocks. Now moving on to MY part… we were served Chef Avila’s choco cake and a crème brulee. 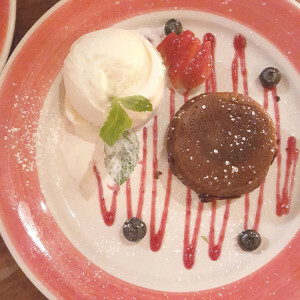 The chocolate cake was made from dark chocolate that was baked through and served with homemade vanilla ice cream, and I was glad this wasn’t pretending to be a molten lava cake. The dark cocoa flavor was quite prominent as the cake was a LITTLE bit over, but it was still good and warm and not too sweet and went hand in hand with the ice cream. The crème brulee won my vote for dessert, though. It was a simple recipe with eggs, vanilla bean, and cream, and when it’s prepared as it was done at the Malt House, you get this ever so slight jiggle that tells you this sh*t is going to be creamy and flawlessly cooked. The sugary torched top had a great crunch to it. 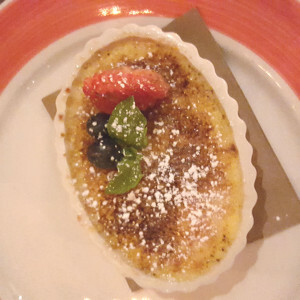 Get the brulee to finish off your meal and leave a happy customer. 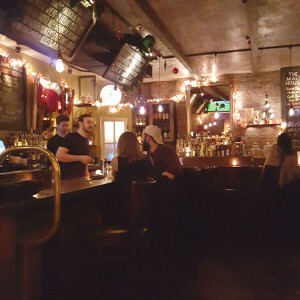 If we are in the area or meeting friends in the West Village, I’d come back here in a heartbeat. It fits all the criteria for a good meet up spot, AND it’s open for brunch and happy hour, too. I hear the brunch comes with unlimited drinks and an entrée for 30 bucks (good deal! ), but the happy hour offers ONE DOLLAR OYSTERS!!! I’m sold. Maybe this summer I’ll stop by and try to nab one of their sidewalk tables outside. If not, there’s always room at the new FiDi Malt House location!